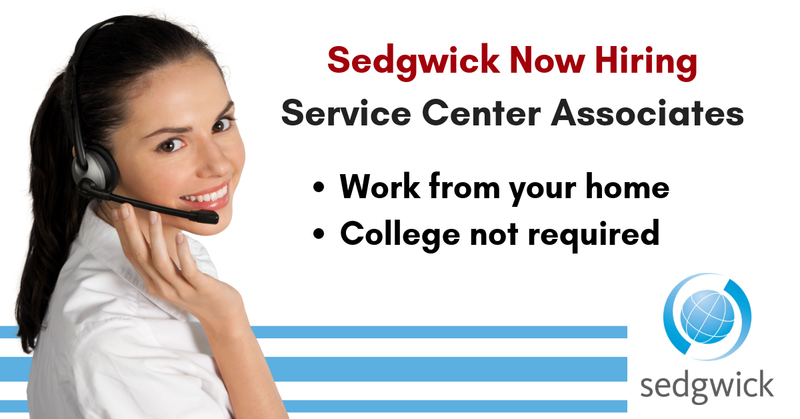 Work from Home Service Center Reps – Sedgwick is Hiring – Benefits, No College Req. If you have a HS diploma or GED and you’d like to work from home for a larger company, Sedgwick — which specializes in processing insurance claims — is hiring Service Center Associates. No state hiring restrictions mentioned. Benefits included. These are full-time slots where you’ll be helping assemble the information needed to process claims, and expediting them. Per employee reviews on Glassdoor, pay averages $14/hr. and ranges from $12 to $15. However, the company hasn’t confirmed these rates and the job listing doesn’t mention pay. PRIMARY PURPOSE: To expedite the Customer Service claims application process; to ensure correct case assignment; and to act as a customer liaison in assisting the customer with the correct contact person to resolve problems and/or questions. Assigns new claims to the appropriate claims handler. Enters verbal and written application information that meets both the internal and external customers’ requirements accurately into the claims management system. Contacts the customer by telephone, written correspondence and/or the claims system regarding documentation required to process a claim, required time frames and claim status. Communicates clearly and professionally with the customer by telephone and/or written correspondence regarding all aspects of claims process. Participates in and maintains a quality service culture within the Customer Service Team. Attendance during scheduled work hours is required. This entry was posted in Customer Service Jobs, Hiring Companies, Jobs with Benefits, Work at Home Jobs and tagged Sedgwick. Bookmark the permalink.